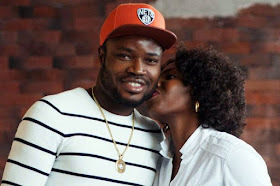 Home » Football news , naija news » Footballer, Fegor Ogude says"I paid N1.3m for my wife's release"
Footballer, Fegor Ogude says"I paid N1.3m for my wife's release"
Super Eagles player who plies his trade in Russia with Ankar Perm, Fegor Ogude has revealed that he paid a ransom for his wife, Memunat Ogude's release, he says he reached a negotiated settlement of N1.3million after the kidnappers initially asked for N30million. The delighted player disclosed that his wife was unhurt while in the kidnappers' den but will undergo medical examinations. "You know that a lot of people will go there and won’t come back alive, so I am happy that she is alright and alive.” he concluded. He'll be the third after Super Eagles player to fall victim to kidnappers after the father of Chelsea player, Mikel Obi and former Christian Obodo, they both regained their freedom.